There are always two sides to the story and what type of decking you should use is no different. Adam Fiander talks to suppliers of both natural and synthetic teak decking. In South East Asia, nestling between Thailand, China, India and Bangladesh, there’s a sovereign state, with a population of some 55 million, which plays a significant role in the supply of a natural, raw material that has adorned yacht interiors and mainly their exterior decks for hundreds, if not thousands of years. That country, of course, is Burma, now widely referred to as Myanmar, although both names are still being used. I am, of course, referring to natural grown teak, and although other Asian countries and different regions, Africa and South America, for example, grow and harvest teak, it’s Myanmar that accounts for around 80% of the world’s commercially available supply. Rising demand over the past 20 to 30 years has caused a steady depletion of teak forests through lack of control, with unscrupulous growers and traders cutting down, exporting and supplying logs before they were fully mature. This caused the Myanmar government to step in and, with further help from bodies of concern such as the FSC (Forest Stewardship Council) and the PEFC (Programme for the Endorsement of Forest Certification Schemes), the situation, while still far from being entirely perfect, has greatly improved, with common certifications in place to prove Myanmar wood has come from legal, sustainable and well-managed sources. A respected Belgian timber importer I spoke to said: “The Myanmar government has put a lot of action in place to secure the long-term supply. They have decreased the annual allowable cut significantly (the maximum amount of trees that can be harvested in 1 year), so forests can re-grow even faster. Also a lot of plantation forests have been planted over the years, which they will start to harvest soon. The government is well aware of the value of its forests, both economically and ecologically, and the only way to keep and grow their precious asset is by its long term management. “The PEFC is running a project with MFCC (Myanmar Forest Certification Committee) to close all possible loopholes in the Chain of Custody, to assure the legality and traceability of the timber. Of most relevance to the readership of this magazine, the EU Timber Regulation (EUTR) came into force on 3rd March 2013 making it illegal for teak suppliers and traders to place illegally harvested timber and timber products on the EU market. With the back history that surrounds teak and the higher cost of sourcing and installing it, the opportunities for alternative teak suppliers has never been better. 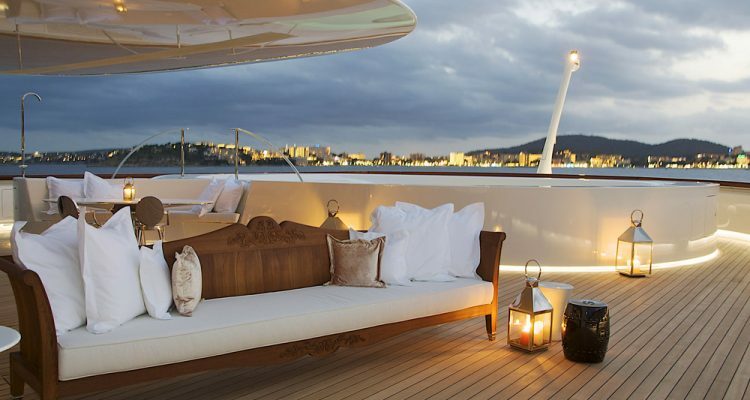 Teak deck substitutes on yachts and boats are nothing new. Composite, PVC, resin based and other synthetic products were first used on smaller size and lower value production boats in and around the 1980’s and since then, of course, demand and product sophistication has increased considerably. 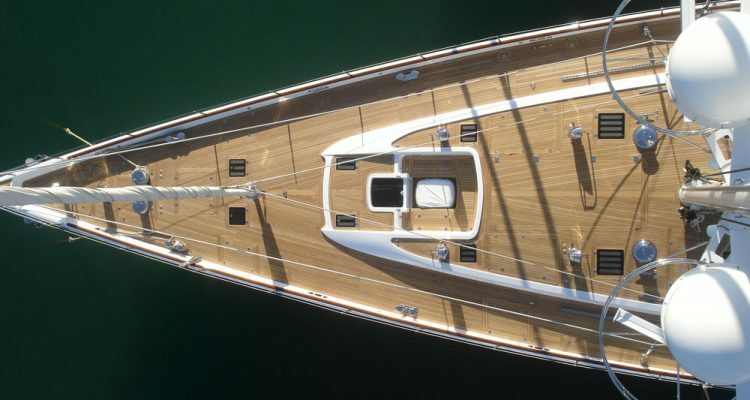 Depending upon what the beneficial owner / client decides, it’s a fact nowadays that even the most revered and respected northern European superyacht yards are using teak substitutes on some of their best and most exclusive yachts and are justifiably proud in doing so. It’s true that when looking for alternatives most still opt for the sophisticated mimicking of natural teak, with its golden brown colouring and black caulking effect, but you’d be amazed what other surface ideas are out there. Technology has opened up a world of possibility in the area of colour, texture, thickness and design options for those who decide to go down the route of considering a substitute to genuine teak. 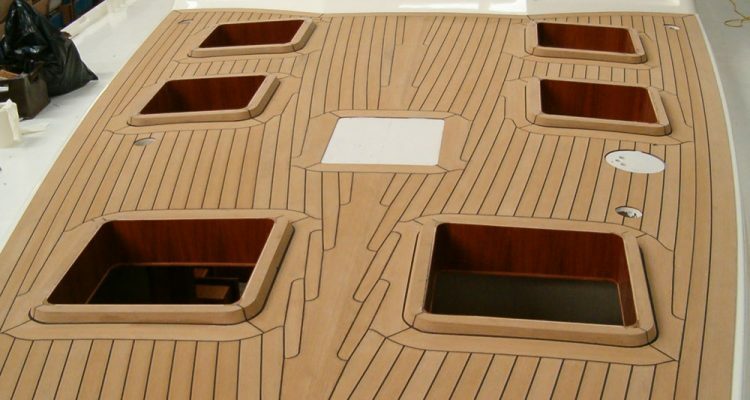 One company who have taken the entire DIY teak substitute concept a long way, is Florida based SeaDek Marine Products, who have a faux teak material made from soft yet durable, closed-cell PE/EVA (Ethylene Vinyl Acetate) in the form of pads with bevelled edges. The pads are supplied CNC cut to size, for the owner then to carefully position and apply by him / herself peeling off the adhesive backing paper and applying as easy as that! Another company, this time using a franchise-based dealer/installer network I spoke to is Easy Tek (known as Tek-Dek in Europe), passionate people, with strongly-held views about their PVC composite pre-fabricated panels. 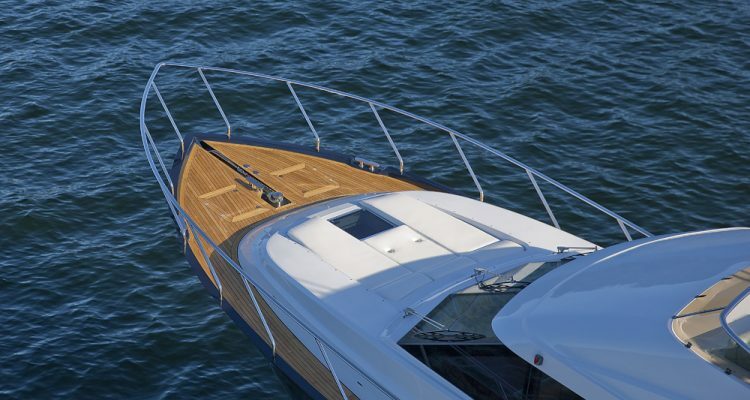 Reinier Waardenburg from the Easy Tek training centre told us: “EVA is a nice optical and comfortable addition for a boat, but not as a replacement for teak and certainly no match for PVC in terms of durability, maintenance and cost! Most composites contain organic materials which can turn green with algae and can deteriorate. Real teak is expensive, not durable and environmentally it’s simply ‘not done’ anymore. I’d say at this moment in time PVC is the better choice on all fronts. Although I salute those companies who supply synthetic-only teak alternatives, with their popularist view to ‘save the planet’ through cutting down less tress. Other suppliers and installers I talked to have recognised the commercial benefits of offering both genuine and alternative teak options to their customers. Focussing on the North and South American markets, yet still with the ability to handle enquires from other parts of the world, Canada based Ideal Teak Inc have a no-nonsense website extolling the benefits of both natural and synthetic alternatives. With traditional teak on offer and established alternatives from Esthec and Dek-King, both of which are well respected brand names I have come across before. I asked Aaron Nielsen what his view was on the commonly raised question of ongoing care and maintenance, and he said: “A properly made teak deck, with full-depth caulking seams, quality vertical grain and Fasten less vacuum bagged installation will not require that much work to maintain. Teak decks get a bad reputation for maintenance, due to an inferior quality wood used and bad installation on board”. “The look and feel of natural teak, as well as its sound insulation properties and ability to keep things cool or warm below deck level, are the kind of factors our customers love most about natural teak. Another company supplying both 100% natural and alternative teak deck solutions is Eurodesign Group Indonesia. Their alternative look-a-like solution is a kind of halfway house, in so far as it’s made of 60% recycled teak, 30% recycled plastic and 10% binding materials and colours. Not only does it look the part, but it has a non-slip surface just like teak and can genuinely claim to be environmentally friendly. 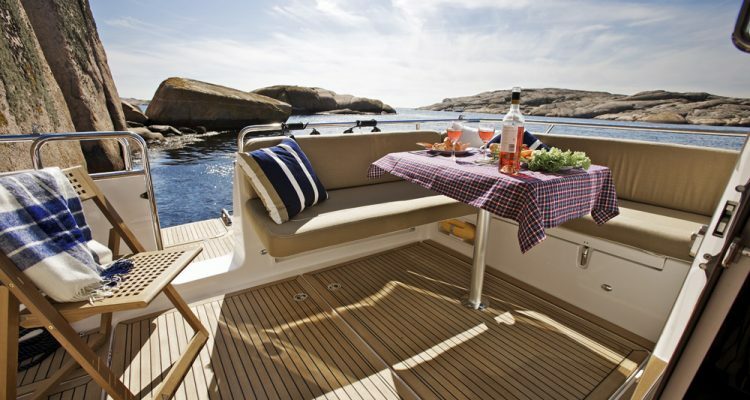 Eurodesign’s Peter Jonsson said: “Our wpc (composite) decking is about 30% cheaper than our teak decking. Ours is made of 60% teak, so we consider it a teak product. Compared to real teak it doesn’t turn grey and just normal cleaning is required, perhaps just re-brushing after a few years. While Jon is clearly extremely passionate about the benefits of natural teak, he’s also a realist about the less than positive aspects: “The supply of teak is a huge cause for concern and every year it becomes more and more difficult to obtain teak of the quality demanded by our clients and, at the same time, making sure that everything is in order to meet EU Timber Regulation. “The very word ‘sustainable’ suggests that teak comes from plantations but, unfortunately, this is not the case for the marine market. It’s true there are many teak plantations, not only in SE Asia, but also Sth.America and parts of Africa, but none of this timber is destined for marine. 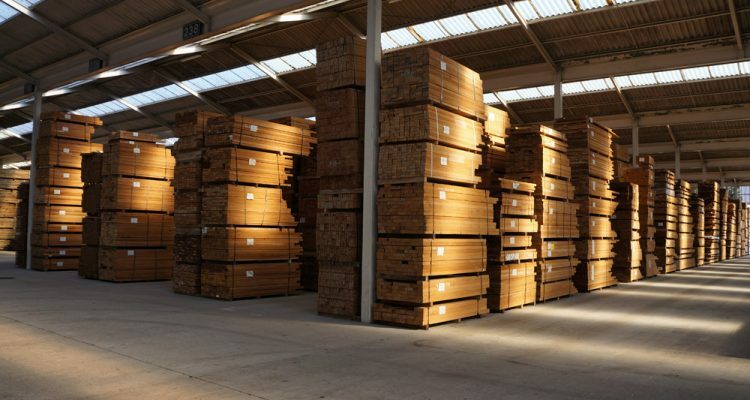 The only teak suitable for marine decking is from ‘wild’ trees, therefore, we have to ensure harvesting of these logs is carried out responsibly and that each tree purchased has a reliable paper trail, to ensure that correct forestry management has been maintained. John Shinske, Managing Director of Barcelona based Teak Solutions was away from his office and somewhere in deepest Myanmar at the time I was compiling this report. John told me he was personally overseeing the quality and supply of his next batch of teak. “Wood is soft, plastic is hard. Wood is cool, plastic is hot.” I think you can guess which side of the argument John is on! So when I floated the idea that teak is generally regarded as being hard to treat, clean and maintain in good condition, he countered with another strongly worded argument that I struggled to disagree with, when he said: “Everything on a yacht requires maintenance as it lives in a harsh environment. This includes the exterior paint, window glazing, interiors and engineering. 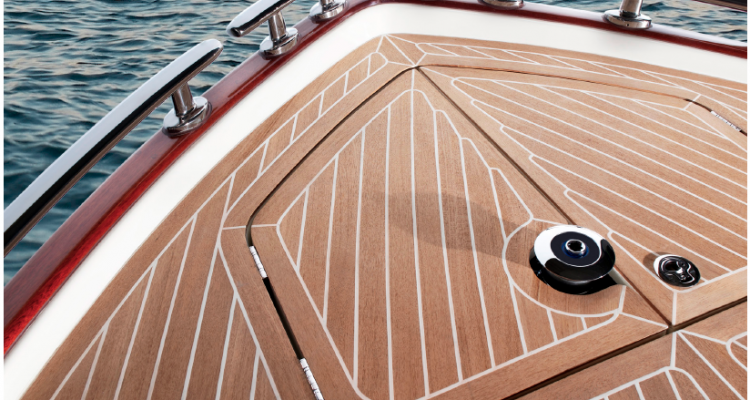 Teak is one of the friendliest surfaces on a yacht. A new paint job is required every 5 to 7 years and costs three times what a new teak deck will cost, which will only require replacement every 15 to 20 years! To summarise, there’s an awful lot of interesting and innovative teak substitute and composite deck products and suppliers out there gaining market share for different reasons. And as for almost every kind of purchase made in life, cost and quality varies, but simply to ignore this increasing technological trend would be a big mistake. On the flip side, yes, natural teak is more expensive than alternatives, yes, it requires more maintenance and attention to keep it looking good and nearly always requires professional, skilled installation, by people who know what their doing. But as the saying goes: ‘first impressions count’ and probably never more so than in this market when those high-flutin’ guests arrive onboard a boat. For some people, the fact that teak is scarce and difficult to source in the required quality makes it even more desirable than ever before.